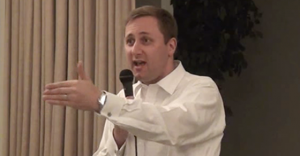 Conservative leadership candidate Brad Trost rejects climate science – and "the whole silly agenda." What constructive ideas are Conservatives bringing to the climate change debate? Trost assured the audience that he studied “geophysics” as an undergrad. Trost’s campaign told PressProgress that “Agenda 21” refers to a sustainable development action plan passed at a United Nations Earth Summit held in 1992. However, the very same “Agenda 21” figures prominently in one-world government conspiracy theories popularized by far-right media figures, including Glenn Beck and Alex Jones’ Infowars website. “In the last several years, an obscure United Nations accord called Agenda 21 has emerged as something of a unified field theory for the antigovernment movement. On its face, Agenda 21 does nothing but provide countries and communities with a set of principles to grow smartly — a plan, in short, to fight overpopulation, pollution, poverty and resource depletion. But for a far-flung network of antigovernment extremists who have risen up to attack it, the nonbinding document that was approved 20 years ago at the UN’s Earth Summit in Rio de Janeiro is not really about preserving the planet at all. Between the lines, they argue, lies a blueprint for the ‘New World Order’. Think you’re having a bad week? 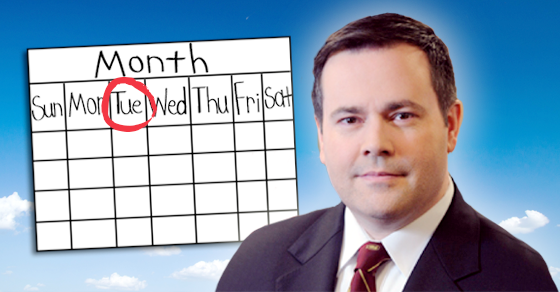 Hey, things could be worse – for example, your name could be Jason Kenney.